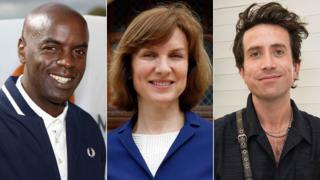 Some stars have had pay increases, while others have dropped down the list - although in many cases, such as with Claudia Winkleman, this is a result of some programmes being produced by BBC Studios, which is now considered a commercial entity and so no longer counted. BBC News and elections and news specials. The BBC has previously reported he's taken a pay cut. Radio 2 & Eggheads. Points of View is made by BBC Studios. The BBC has previously said he's also taken a pay cut. 5 live Breakfast and Your Call. The BBC has previously said he's taken a pay cut. Radio 4 Today programme. Mastermind is made by BBC Studios, accounting for some of Humphrys' drop. The BBC has previously said he's also taken a pay cut. Today programme & Political Thinking. The BBC has previously reported he's taken a pay cut. Newsnight & Radio 4's The Bottom Line. Dragons' Den is made by BBC Studios.